VietNamNet Bridge - There is a fairytale that for along time has its climax repeat again and again at a more compelling level, andfinally it had a happy ending. It is the story of the Maison Chance House ofTim Aline Rebeaud. Tim in a fact-finding trip in Dak Nong Province.In the near future, with the hands of many people, the model of the MaisonChance will be here to help unhappy people (photo provided by the character). The storyis more remarkable when it happened in a world where people are increasinglyindifferent, cold and cruel to each other. Life hasexotically random arrangements. In 1992, Aline Rebeaud, at that time was abeautiful Swiss girl of 21 years old, made the trip around Asiato find inspiration for her painting career. In HCM City,once Aline met a poor child wandering in an empty alley in the evening. The twohad never met each other before and they did not know each other's language,but their hands touched each other and a coherence arose. The child neededAline’s and Aline could not turn away from such a case. The nextdays, Aline Rebeaud knocked on the door of many different agencies to find aplace for the child. Everyone was interested in the case but at that timeeverything was not easy. Then she went to many social centers and she realizedthat the city seemed to lack a place to nurture and educate wandering teens. One time,she dropped in at the Th Duc psychiatric nursing center and met Duc Thanh, 12years old, who suffered from severe diseases and was facing death. Aline Rebeaudasked the center to give the child to her to seek treatment. At the Ho Chi Minh City Heart Hospital,doctors shook their heads because the disease was too severe. She took the boyto Nguyen Tri Phuong Hospital, where they agreed to receivethe boy but with conditions that Aline had to stay in the hospital to take carethe boy since he did not have a relative. Threemonths passed, as if by magic, Thanh was cured and since then everyoneaffectionately called Aline Rebeaud as Tim, because Thanh was treated at theTim (Heart) Ward and Aline had a beautiful "heart". Asking Timwhy she has stuck with this land for 20 years, she smiled and said: "MaybeI used to live here in my previous life." It is her answer, but anotherreason, in my opinion, because Tim is a loving girl. After achild, two children and three children, Tim admitted so many more wanderingteens into a facility that she founded and called it the Maison Chance House. Firstly,Tim set up that facility with her own money, from selling her painting. Out ofmoney, she asked for support from her family and friends. After that shereturned to Swiss to set up the Maison Chance Society to call for assistancefrom sponsors around the world. The MaisonChance house kept developing. So far she has had three facilities in Binh HungHoa Ward, Binh Tan District, HCM City. The firstis the Maison House, with 50 people living together as a family, includingorphans, street children of ten years old and older and poor workers who sufferedfrom paralysis because of occupational accidents. In 2005,the Chap Canh Centerwas formed to help paralyzed patients learn a job after recover to earn aliving themselves. The center has classes for people in wheelchairs such assewing, drawing, computer, making fine art crafts. Whileworking at the center, many members fell in love and eventually got married andhad children. They had to rent a room and encountered lots of inconveniencesbecause this place is only for ordinary people. Tim toldme: "You should imagine, after work, they go home and want to bathe andrest. But in the rainy season, the road is flooded. To go home, they have topass the slopes, to go to the bathroom, they have to pass the steps, which isvery difficult for a paralyzed person." Since 2007,Tim raised funds to buy a piece of land of 3.500m2 to build a new facilitycalled the Maison Chance Villagein 2011. The villageincludes 40 apartments specially designed for wheelchair users and classroomsfor children who are unable to attend school normally for many reasons (loss ofpersonal papers, too old to go to school, the poor who cannot afford schoolfees), a cake-making teaching room for children growing up in Maison Chance anda restaurant for external customers. On theevening of July 5, after 20 years of operation in Vietnam, the Maison Chance wasofficially launched at the HCM City Opera House. Timcheerfully said: "In recent years, Maison has helped thousands ofVietnamese people, but now it needs to expand to the remote areas, where thereare many disadvantaged people who need support. I'm thinking of a project inDak Nong." "Why DakNong? ", I asked. Tim replied: "Perhaps Dak Nong is the only province of Vietnam that does not have any socialpatronage center. 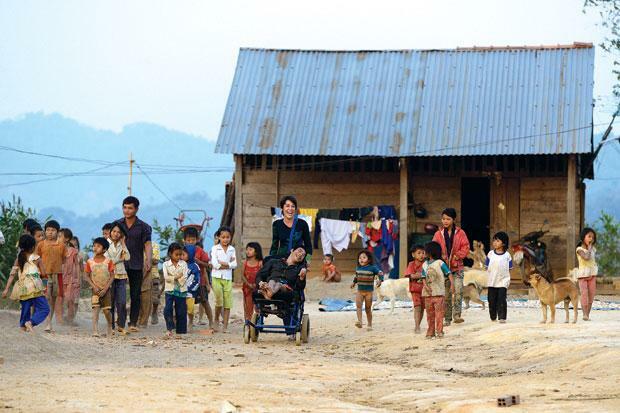 In the future Maison House in Dak Nong, people withdisabilities will live in the house, where they will do husbandry, cultivationand be educated and treated." Tim's ideaseems to never run out. She said, for the Maison houses in HCM City,any philanthropist can come to help, but in Dak Nong, the Maison house must bea special place to draw people traveled from afar to. She willbuild a resort combined animal preservation. "In Dak Nong we will focus onthe subjects with mental disabilities (children with cerebral palsy, Down'ssyndrome). These people usually do not like contact with people but to animals.And those with the movement problem will be riding to heal. In the West this methodof treatment is relatively developed, called pet therapy "Tim said. 20 yearsago, Maison was only a temporary thatched house, but now it is definitelyconcrete blocks. 20 years ago, Tim was a beautiful girl, but now with the timewrinkles started appearing at the corner of her eyes. 20 years of youth areprecious for normal people, but if it's time that a woman from a developedcountry spent for a developing country, it is more precious. With thespecial contribution of Tim, the Vietnam President has approved herVietnamese nationality. From now on she will take a full name: Hoang Nu NgocTim. 20 yearsfor the story about the Maison House is also the beautiful story of a heart.Last weekend, I witnessed the lives of members here. Some people have foundtheir other half, had children and their children are successful and even studyabroad. Many people have had stable jobs and stable lives. And there are thosewho find the value and the true dignity of man. But whoever, they are alllucky. I cannot imagineif the Aline Rebeaud did not come to Vietnam 20 years ago, then howtheir fates would have been like now. Tim said:"It's been half a lifetime. The time I’ve been here is longer than in Switzerland.Tim does not go anywhere. Each year I leave Vietnam once to find funding andeach time I’m homesick and want to return home quickly because my home ishere." Whensomeone asked Tim about her private life, she smiling replied: "A personwho is busy all day to take care for others then there's no time to care for anindividual any more. Besides, I have many children at Maison, they call meMother Tim."